Mark Seliger says a sense of humor is what differentiates his portraits. Above, comedian Jerry Seinfeld as the Tin Man from The Wizard of Oz. 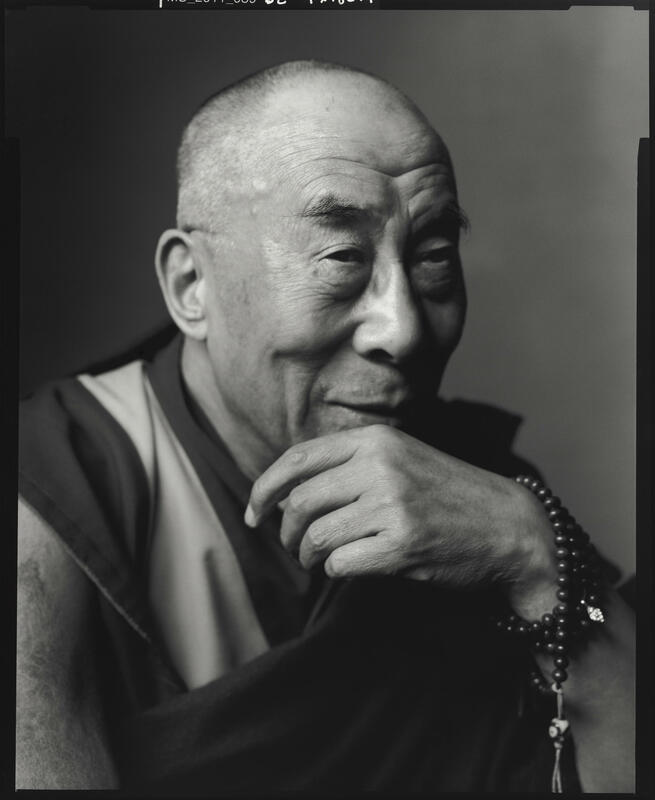 The monks who accompanied the Dalai Lama to his portrait session told Seliger not to ask him to remove his glasses or his watch — but that's exactly what Seliger did. Look closely — that's Brad Pitt photographed among the redwood trees. Seliger had just six minutes to photograph Barack Obama. During the session, Obama asked if this angle would make his ears look big. Seliger said, "Absolutely not." 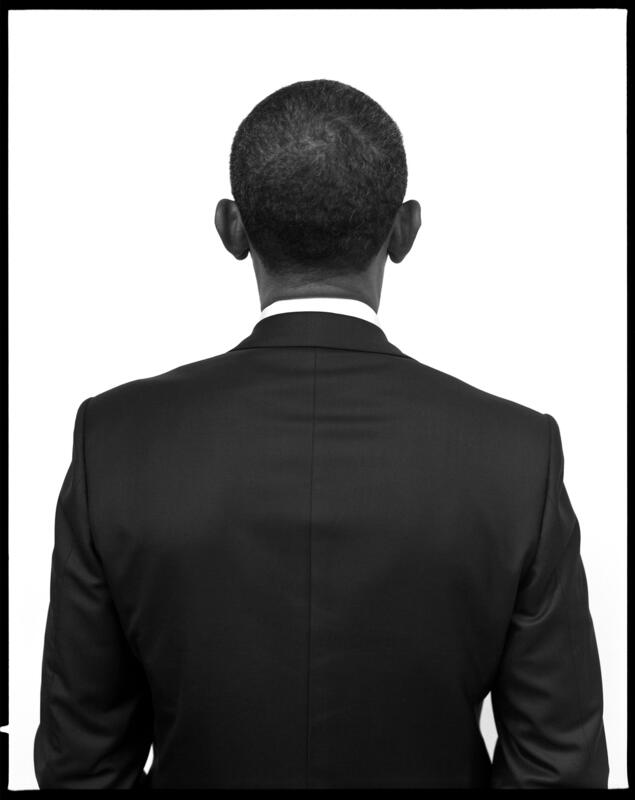 Seliger has dressed up Jerry Seinfeld as the Tin Man and photographed the back of Barack Obama's head. But he's prepared if celebrities aren't game for his portrait ideas. "I always have a backup plan ... " Seliger says. "At times, the simplest portrait is the hero — it's the one that works the best." Now, a new coffee table book called Mark Seliger Photographs collects some of the best images from his last 30 years, including presidents, actors and rock stars. We wanted to paint the Red Hot Chili Peppers red and have smoke coming out of their mouths. And I was told by the band that that was not going to happen. But Flea [who's] one of the band members, very sympathetically decided that he would allow me to paint him half-way on his face. And I went ahead and did that and he looked at me and he said, "Yeah, we're not going to do this." ... It was a bad idea. ... I have to admit that I've had some real loser ideas, too. I like the idea that it was reductive. I like the idea that it was very stripped down and that you really got a chance to see his eyes. ... It wasn't a long session. It was 10 minutes, so I really wanted to have the impact of, you know, the depth of him and the spiritual connection that he brings into the world and that felt like the best way to do it. I was really not drawn to photography to take pictures — I was actually really inspired through the darkroom. ... I made a darkroom in my parents' house when I was growing up. They would go out on a Saturday night and I would spend hours making prints. I just fell in love with the process. And as that love kind of grew, I had to have something to be able to print, so I thought: I better start taking pictures — and that's how it all evolved. I never really thought that I'd end up here. What digital photography has has done is it's allowed you to view things in real time so you have this very immediate sense of what you're doing. But what I really miss is that surprise of getting a contact sheet back, spending time on the photographs and trusting the editing process that happens naturally when you're working with a subject, where you're not looking at a screen, where you're seeing the image in your head. There's a natural progression to the session where you can see the rise of the enthusiasm of the subject, or the intricacy of the subject, and then it winds down to the end of the session. And that, to me, gets a little bit lost when ... you're looking at a screen or there's a group of people standing by you looking at the screen and helping you make that decision. ... It's not as intuitive. What I love about doing portraits is that if you can get something that no one else has gotten and do something special then, you know, you've done your job. I love that kind of challenge: To go in there and create something that's never been done before. Kat Lonsdorf and Jolie Myers produced and edited this interview for broadcast. Beth Novey adapted it for the Web. For decades, Americans have seen celebrities through the gaze of Mark Seliger. He's a photographer whose work has appeared in magazines like Vanity Fair, GQ and Rolling Stone. Now a new coffee table book collects some of his best images from 30 years, including presidents, actors and rock stars. I began by asking him what he thinks makes an image look like a typical Mark Seliger photograph. MARK SELIGER: I would say one of my gifts in creating is having a sense of humor to the work. And whether it's a big concept or whether it's a wink is really, you know, kind of the broad strokes of the way that I think about photography. So I'd say humor. And I'd also say that I started in magazine photography with really a good balance about color. And that - at the time that I started not a lot of people did that. So that was a benefit for me. 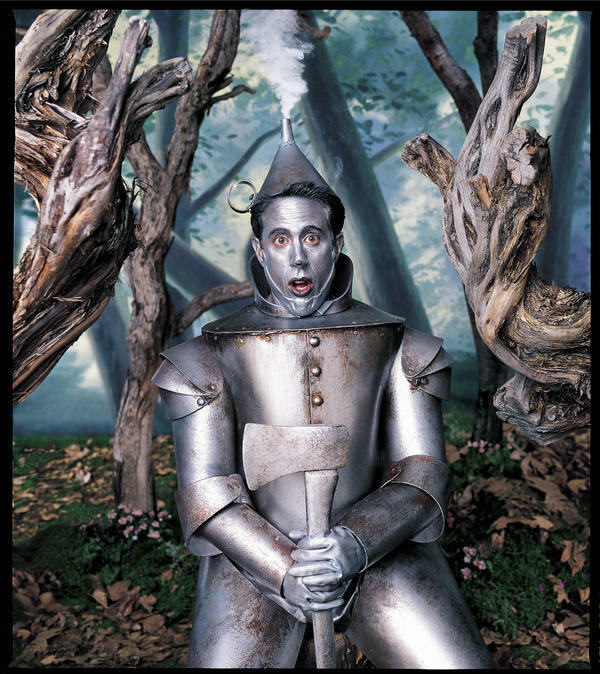 SHAPIRO: When you talk about putting humor in your photographs, it's easy to see how you do that with, for example, a photograph of Jerry Seinfeld as the Tin Man from "Wizard Of Oz," which is one of the images of this book. But then you're also photographing politicians and rappers and people who don't necessarily have a reputation for having a sense of humor. Have there been instances you've tried to inject humor into those photographs with more or less success? SELIGER: Sometimes I won't tell the subject what I'm going to be up to. But I always have a backup plan, and that is usually a very simple portrait. And, you know, at times the simplest portrait is the hero. It's the one that works the best. But I've been rejected. SHAPIRO: Who's one of the band members. SHAPIRO: (Laughter) And in hindsight, do you think it was a bad idea? Or do you think they just weren't game? SELIGER: It was - it was a bad idea. You know, I have to admit that I've had some real loser ideas, too. SHAPIRO: Was there one that surprisingly worked that you thought - like, the Dalai Lama wouldn't be willing to - no, it's a very formal portrait of a Dalai Lama that's in this book. But somebody like the Dalai Lama who you thought would never be game to do something crazy who actually was. SELIGER: Well, you know, the Dalai Lama's actually a really interesting story because I was told - we had 10 minutes with the Dalai Lama. And we set up a studio downstairs of the conference hall that he was speaking at. And in walked the Dalai Lama with, you know, some of the monks that were accompanying him. And they said, you know, you don't ask him to take his watch off or his glasses. And that was the first thing that I asked him to take off. And he said, sure, why not? And I just looked over, and there were some very upset monks. But we got through it. SHAPIRO: Why did you ask that? Were you just trying to be rebellious? Or was there something about the image without the glasses and the watch? SELIGER: I liked the idea that it was reductive. I liked the idea that it was very stripped down and that you really got a chance to see his eyes. And I think I accomplished that in the portrait. It wasn't a long session. It was 10 minutes. So I really wanted to have the impact of, you know, the depth of him and the spiritual connection that he, you know, brings into the world. And that felt like the best way to do it. Glasses and a watch on such a - you know, on the holiness just does not make sense to me. SHAPIRO: Do you ever leave a shoot knowing that if you were choosing images for an art gallery you would choose something different than what's going to be in the magazine? 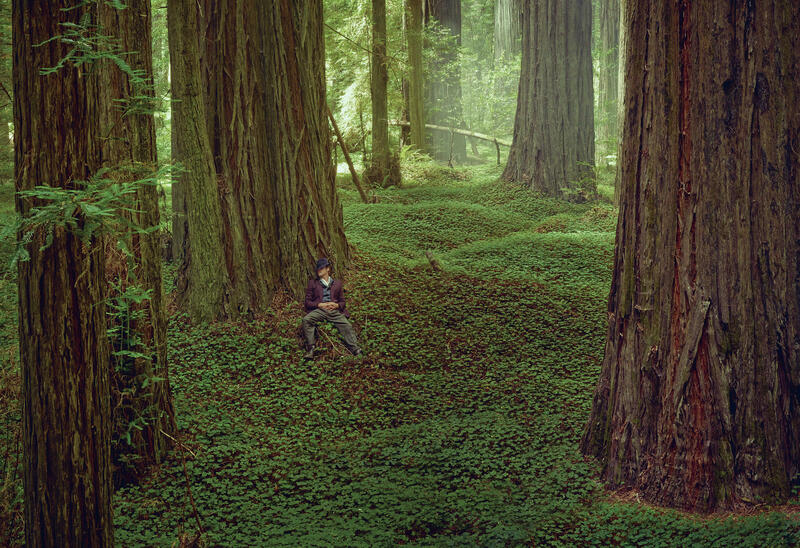 I mean, I'm thinking, for example, there's this incredible photograph here of massive redwood trees. And the ground is blanketed with green. And there's a small human figure laying against one of the trees. Turns out that figure is Brad Pitt. But you might not know it just from looking at the photograph. SELIGER: Well, I don't really differentiate that work from pictures that I - you know, I assign myself, self-assigned stuff. And really it's to create something that I'm going to be happy with. I know that if a photograph strikes me as being - you know, having impact and having an emotional response or feeling that special, that it'll translate in the pages of magazines. And then in terms of, you know, selecting work through the years, I mean, it's an editing process finding, you know, the images that I think hold up and the people that hold up. So it's a little bit of a balance of that as well. SHAPIRO: Did you always know that you would be this kind of a photographer? Or did you ever think you wanted to be Ansel Adams or some other kind of artist? SELIGER: Yeah, it's funny that you say that, Ari. That's a great question because I was really not drawn to photography to take pictures. I was actually really inspired through the darkroom. Actually, I made a darkroom in my parents' house when I was growing up. And they would go out on a Saturday night, and I would spend hours making prints. I just fell in love with the process. And as that love kind of grew, I had to have something to be able to print. So I thought, I better start taking pictures. And that's how it all evolved. SHAPIRO: I can't let you go without asking you about the image that's on the back of this book. SHAPIRO: You had six minutes? SHAPIRO: And you had decided you were going to get two good images? SHAPIRO: Like, appalled that you had a chance to photograph the president, and you said you wanted to photograph his back? SELIGER: His back, yes. And as I was giving him direction, he goes, wait. Is this going to make my ears look big? SELIGER: And I said, absolutely not. And he goes, all right, that's enough art, Mark. SHAPIRO: That's enough art, Mark. SELIGER: And then he walked away. And we actually did one other photograph, and that was the day. But what I love about, you know, doing portraits is that if you can get something that no one else has gotten and do something special, then, you know, you've done your job. And I love that kind of challenge to go in there and create something that's never been done before. SHAPIRO: Well, Mark Seliger, thanks so much for talking with us about your work. SELIGER: Thank you for having me, Ari, and hopefully I'll see you soon. SHAPIRO: I hope so. The book is called "Mark Seliger Photographs." (SOUNDBITE OF REAL ESTATE SONG, "DARLING") Transcript provided by NPR, Copyright NPR.